For information on more of the fabulous restaurants available to food lovers in Todos Santos, please see our other categories including Great Food, Great Chefs, Great Atmosphere; Wonderful Food in a Beautiful Garden Setting, Killer Local Joints and Taco Stands and Cafes, Healthy Fare and Live Entertainment. All restaurants are presented in alphabetical order within each category. 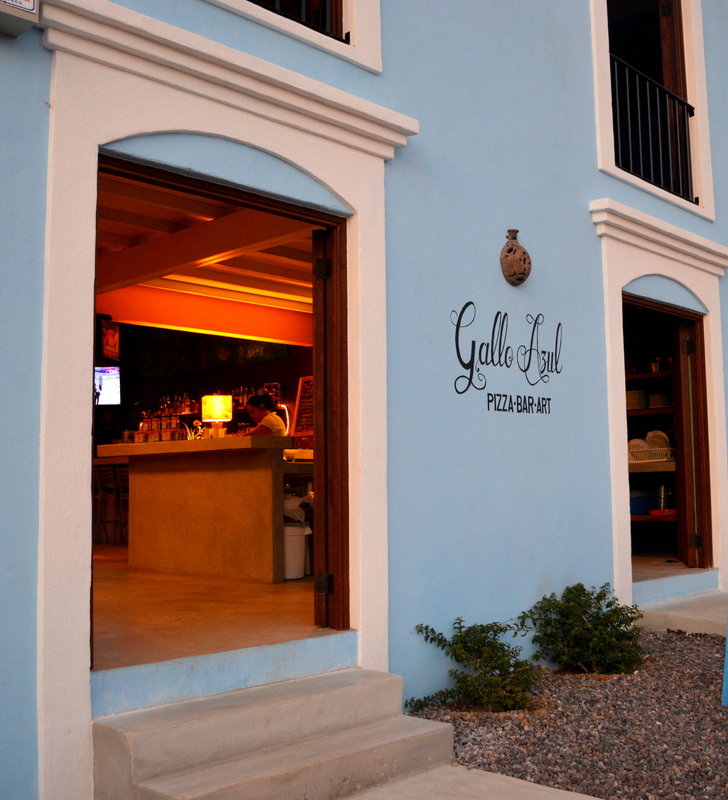 Overview: Local entrepreneur Alan Becerril created Gallo Azul Pizza Bar in 2013 and it’s a great addition to the Todos Santos restaurant scene. Alan serves up authentic Napolitan pizza made in a blisteringly hot wood-fired oven with a volcano stone floor with natural leavened dough – the results are delicious. There is a full bar, great salads and lots of fun events like Saturday night Latin nights with salsa lessons. Overview: As with everything else on the menu, the thin-crust pizza at the Cafe Santa Fe is fabulous. It ain’t cheap but you get what you pay for! Overview: The Hotel California restaurant serves up a pear and gorgonzola cheese pizza that is fantastically delicious. Overview: This is a great little spot in the middle of town that cranks out very tasty, very affordable pizzas from 1:00 PM to 10:00 PM every day but Wednesday. It’s a favorite with locals. You can do take out or take advantage of the simple seating at the restaurant and enjoy cold beer and soft drinks with your meal. Overview: Coming soon – stand by for details! Overview: Fun tropical bar atmosphere with full bar and good bar fare including burgers, ribs, steaks, wings and hot dogs. 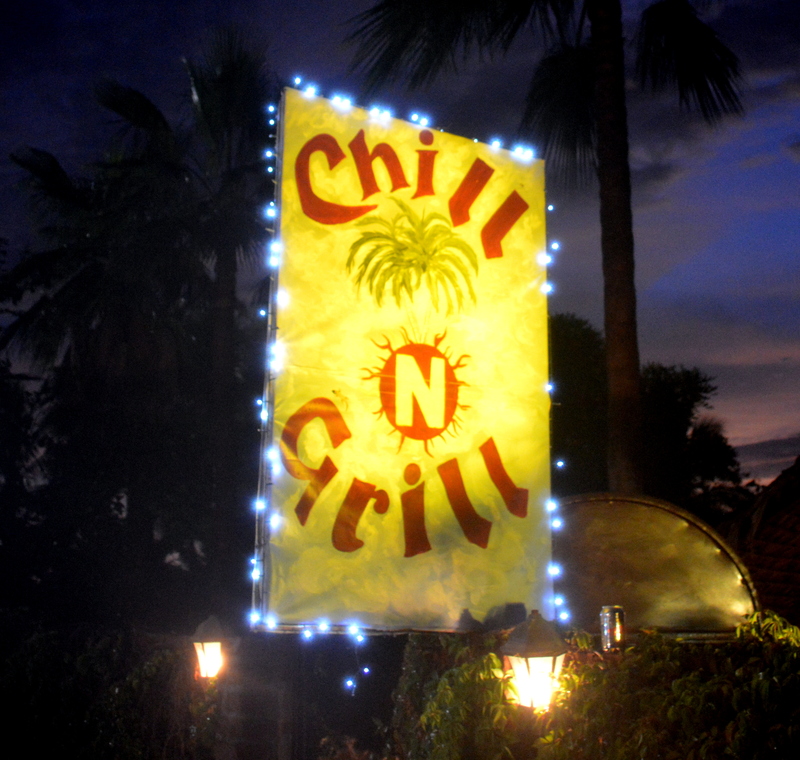 (Best vegetarian option is to stick to the booze or get take out from Our Pura Vida next door – the owner of the Chill ‘N Grill and the owner of Our Pura Vida are brother and sister!) Pasta Mondays, Taco Tuesdays and 2-for-1 happy hour 4-6 PM every day. NFL and other sporting events flowing on the bar TV. They often have live music on the weekends. Hours: 4-10 PM daily (unless everyone’s having a great time and you can stay later); Sundays open at 10:00 AM for ball games. Overview: Big open-air space with a long bar, pool table, foosball, and darts, and lots of fun art work all around. The bar food is pretty yummy, with 1/2 lb Burgers (including a seriously tasty veggie one), Nacho’s, Salads, and Wings, all washed down with draught and bottled beer served up cold. Monday nite Football comes with 20 peso draughts, and free nachos, Wednesday features a pool league, Thursday is movie night, Saturdays feature haircut and a beer, and Sunday is NFL all day. 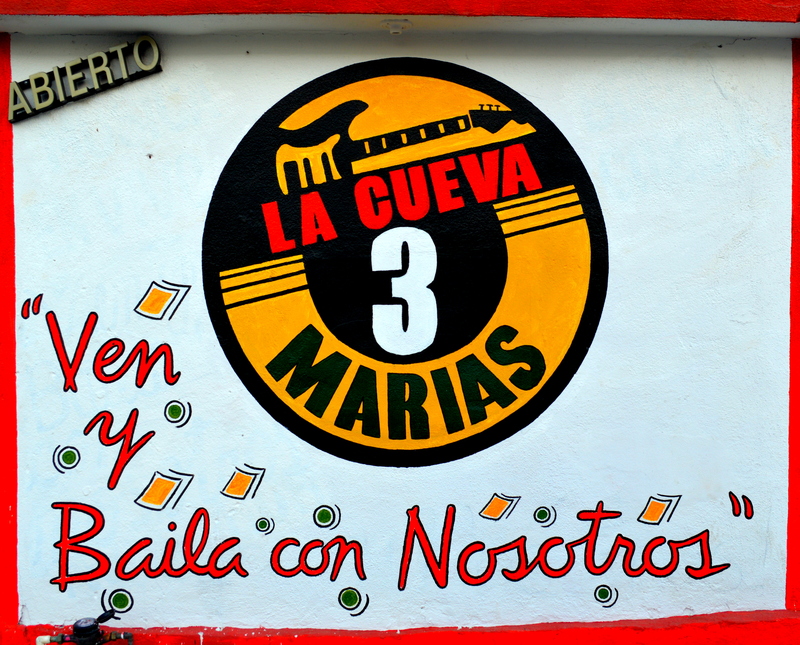 They often have live music on the weekends, and food specials like pozole. Hours: Kitchen is open every day but Tuesday, 12:30 PM to 10:00 PM. Bar is open until 12:00 Midnight (or so). Overview: Some visitors to town told us just the other day that they’d found a great place in Todos Santos for their prayer meetings. Turns out they are born-again members of the Church of Football and Shut Up Frank’s had been providing all the spiritual sustenance they needed! 4 large screen TVs running nonstop NFL football, as well as NHL hockey, UFC and more make it a sinner’s sports-viewing paradise. And the food is pretty darn good too. The place has been famous for its burgers for 20 years now, and they grill up an array guaranteed to please most any palate – turkey, chicken, fish, veggie and beef. All served with terrific fries. To round out the bar menu they also serve up fish ‘n chips, wings, steaks and salads. New Italian menu with pizza and other specialties coming soon. Hours: Open 10:00 AM to 10:00 PM every day but Tuesday. Happy Hour 3 to 6 PM, Monday through Friday. This entry was posted on September 28, 2014 by Todos Santos Eco Adventures in Culture, Food, Live Music Todos Santos, Travel Industry and tagged Alan Becerril, Cafe Santa Fe, Cueva tres marias, Gallo Azul Pizza Bar, Hotel California, Napolitan pizza, Todo Santos Burgers, Todos Santos pizza, Todos Santos restaurants.